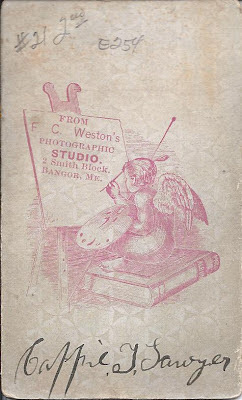 Carte de Visite of a woman identified on reverse as Cappie J. Sawyer; by the Bangor studio of F. C. Weston, 2 Smith Block, Bangor, Maine. At first I thought she was identified as Cappie T. Sawyer, but after some online research, I believe she was Capitola Jean Sawyer, who married Edward Mayes Dysart. Capitola Jean Sawyer, "Cappie", was born about June 1868 at Medford, Maine, or Chester, Maine, the daughter of Alfred Freeman Sawyer and wife Eliza J. "Jennie" (Keen) Sawyer. I believe Alfred Freeman's parents were Andrew and Harriet (Lombard) Sawyer. He was born about 1844, but I haven't found a birth record for him. According to her birth record, Eliza J. Keen was born 26 August 1844 at Chester, Maine, the daughter of Seneca and Mary Keen. I found birth records that list Seneca Keen as the son of James and Lovisa Keen, born on 13 December 1806. One record shows him born at Hartford, Maine, in Oxford County; the other shows Salem, Maine, in Franklin County. There was another Seneca Keen or Keene about the same era in Maine, and some online references seem to have the two confused. Hopefully a reader will be able to solve the mystery. About 1888, Cappie married Edward Mayes Dysart, son of Samuel M. and Mary J. (Case, I think) Dysart. He was born about December 1865 in Maine. His paternal grandparents were William and Martha (Livingstone) Dysart. His maternal grandparents were, I believe, Edward Mayes Case and Mary Ann (Frier) Case. Edward and Cappie settled at Bangor, Maine, where they farmed and raised a family of seven children. If you have any corrections or additions to the information presented above, please leave a comment or contact me directly. Thank you so much for posting this. I was able to trace the Sawyer family I have been looking for for yrs. 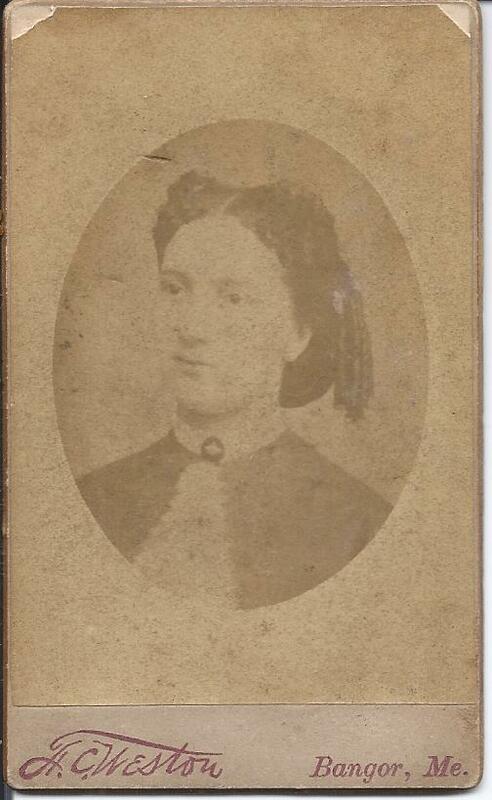 My grandfather's sister married Thomas Sawyer, brother of Cappie. Thanks for your comment! After receiving notice of it, I took another look at the Sawyer and Keen families and made a few additions to this post. I'm still stuck on a couple points, though, so if you have anything to add, especially with regard to Seneca Keen, I'd appreciate it.